Good news for people who enjoy being disgusted — New York City, Capital of the World, is being slowly overrun by rats. Sure, NYC has always been a place for rats to come and prosper, but things have gotten increasingly worse in the months following Hurricane Sandy when the flooding and rain forced the rodents to head inland en masse. It's gotten so bad, in fact, that NYC officials are now calling for a publicly funded eradication program that would focus primarily on the shoreline neighborhoods of of the Lower East Side, Lower Manhattan, Greenpoint, Coney Island, Carroll Gardens and Red Hook. 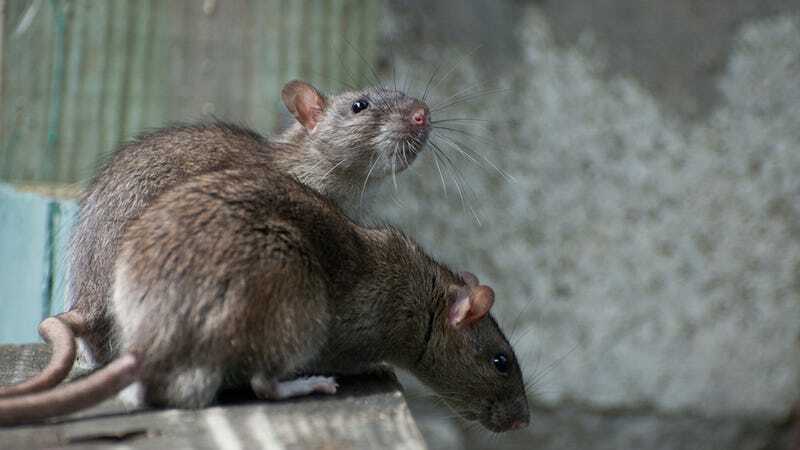 "As New Yorkers, we have a certain level of tolerance for rats," said Councilwoman Jessica Lappin, whose district (the Upper East Side) has been experiencing an increase in rat outbreaks. "But this is a real public health issue, and people are rightly concerned." Exterminators have also noticed an increase in complaints. Says Timothy Wong, a managing partner at eco-friendly pest control company M&M Environment, "It's just gotten so bad. So many calls. It's just crazy." One of those calls came from a family in Harlem who actually had to abandon their apartment and stay in a hotel (look out, the rats own those, too) while M&M Environment did their work.